Know Pike High Class of 1969 graduates that are NOT on this List? Help us Update the 1969 Class List by adding missing names. August 1, 2009 - for the Class of 1969's 40th Reunion. Details are still in the works. It's Official! The Class of 69 40th Reunion is August 1st. Registration deadline is July 20th. Contact me to get on the list! Our 40th Reunion was fantastic! More than 100 people gathered - including 50 from the class of '69, several from '68, '71, '72, '74 - and 13 former teachers. All the spouses had a good time too! For those who toured the high school - thanks Pike Alumni Association and Tim Friend! - what a difference in the school. In fact, we had so much fun, we've already started planning our next reunion. Get ready for our 50th Reunion! A room block is reserved at the Embassy North Hotel - mention Red Devil Reunion to reserve your room. Friday night informal gathering at Bill Todd's. Let us know you will join us! Pike High School Tour on Saturday morning. 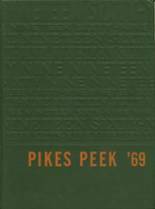 More 1969 alumni from Pike HS have posted profiles on Classmates.com®. Click here to register for free at Classmates.com® and view other 1969 alumni. Missing some friends from PHS that graduated with you in 1969? Check the list below that shows the Pike class of '69.